At the plant in Pratella, a few kilometers away from Caserta (Italy), Acqua Lete SpA, one of the most famous Italian brands of mineral water and main sponsor of SSC Napoli, purchased from ACMI a compact line with a nominal filling speed of 40,000 bottles per hour. 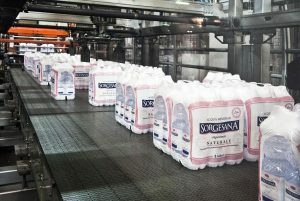 The line in question can handle both round 1.5 L. bottles and square 2 L. bottles, with which, however, the speed drops to 36,000 bottles per hour. 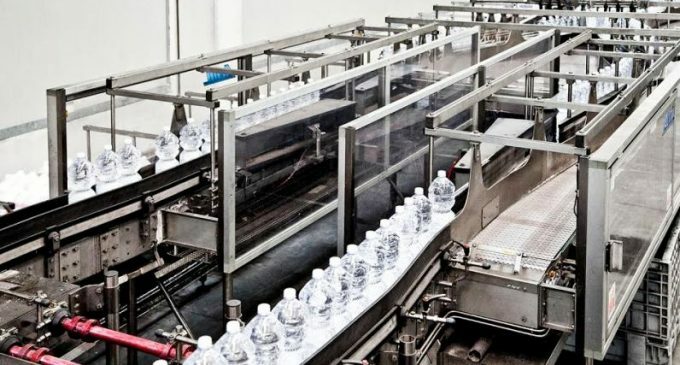 The compact line concept proposed by ACMI is enjoying great success among mineral water bottlers that are looking for a product with increasingly good performance and efficiency. The “Compact Line” represents a new bottling concept in which the production line mainly consists of two highly efficient blocks: the filling block and the packaging block. To date, ACMI is the only company able to design and build a so-called “compact” system because it is the only company that designs and builds with the same high technology all the machines that make up the part of the line dedicated to packaging. The application of this innovative concept produces advantages in terms of efficiency, reduction of space, management costs and TCO, assembly and start-up times. Fenix shrink wrapper with automatic film changeover. The “Compact Line” requires only a single accumulation table placed between the filling block and the packaging block. This detail provides a simple precaution to harmonize any fluctuations in the production that may concern the two blocks. With this solution, the “Compact Line” proves to be suitable to handle any type of PET container, especially thin-walled bottles and square bottles of still water, because the pressure exerted is very limited. From a technical point of view, if the labelling of the bottles is not performed within the filling block, it is necessary to apply an electronic synchronism between the labeller and the Fenix shrink wrapper. This synchronism, which is possible thanks to the use of specific algorithms processed by ACMI, makes it possible to manage the production speed oscillations of the labeller and shrink wrapper and eliminates the need for any intermediary accumulation table. With the application of the “Compact Line” concept, these two machines work synchronously reaching very high efficiency values. 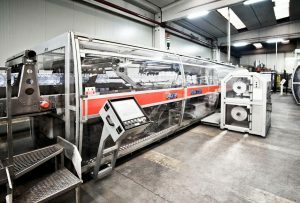 For the “Compact Line” concept to be applied it is necessary for all the packaging block machines to share the same technology and the same level of efficiency. Moreover, they must all be equipped with automatic consumable material feeding and changeover systems, since it is essential for the continuity of operation of all the components of the line to be constantly guaranteed. Precisely for this reason the Fenix shrink wrapper is equipped with the external reel carrier box and the automatic (continuous) film changeover, the Viper two-lane handle applicator is built with an electronic spacing system (which avoids the use of spacing screws) and is equipped with the automatic handle joining system, the Thunder palletiser with the Twisterbox® continuous layer formation system is designed with automatic interlayer and pallet feeding systems, and the Rocket model rotating pallet stretch wrapper is equipped with an automatic pre-stretching unit changeover system which ensures perfect continuity of operation. The “Compact Line” is a highly automated system that requires only one operator for each block. The operator of the ACMI end of line block mainly has to deal with feeding the automatic stores by loading consumable materials. That’s all.